Let’s see how we can check the certificates before applying them, so we can know for sure that the certificate chain is complete. I divided the post in two options, one when you are using your own Certificate Authority (usually called self-signed) and one when using certificates from a recognized Certificate Authority (yes, they use intermediates as well). 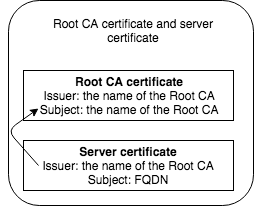 Now that we know the issuer, we can check if the Root CA certificate file we have is the correct one by retrieving the subject of the Root CA certificate file. This should match the issuer on the server certificate file. Note: If it is not showing the expected issuer, it might be issued by an intermediate CA. Scroll down to see how to deal with intermediate certificates. The past example was on a Root CA certificate and a server certificate, if you still see error 20 at 0 depth lookup:unable to get local issuer certificate or the issuer and subject don’t add up, you probably need to include an intermediate certificate. This should match with the issuer of the certificate. We can do the same validation on the intermediate certificate, as the issuer on the intermediate should match the subject of the CA certificate. Note: If you have multiple intermediate CA certficates, you can use the untrusted parameter multiple times like -untrusted intermediate1.pem -untrusted intermediate2.pem . Always double check if everything went well, we can do so by using this command which will list each certificate in order with the issuer and subject. If you use a certificate from a recognized Certificate Authority, you could think that all certificate chains are taking care off. As mentioned in the beginning of this post, most users will test certificates using the browser which will complete most of the certificate chains if they are not being sent from the server. I will walk through an example using Let’s Encrypt certificates. You see that even with a certificate from a recognized Certificate Authority, it still fails to validate the chain. 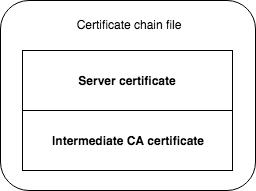 When using self signed certificates, you need to provide the Root CA certificate (and possible intermediates) to validate the chain. 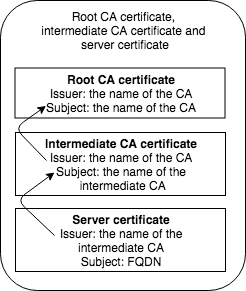 When using a recognized Certificate Authority, you usually only need to provide the intermediate CA certificate (the command above will succeed if there is no intermediate CA). If you are not sure if your Certificate Authority is using intermediates, usually Googling with your certificate provider intermediates shows a page describing the so called Chain of Trust. For Let’s Encrypt, you can visit their Chain of Trust page. The other file that stands out is fullchain.pem, the difference between chain.pem and fullchain.pem is that chain.pem only contains the intermediate certificate. The file fullchain.pem contains both your server certificate file and the intermediate (conveniently placed in the correct order). This means that you should always use fullchain.pem when configuring a server certificate in an application. The only exception here is if the application uses a dedicated file for providing the chain. This output also confirms the correct order of certificates in fullchain.pem , as it shows the subject of server certificate (FQDN), with issuer being the intermediate. In the following lines, it shows the subject of the intermediate (which should match the issuer of the previous section), and the issuer being the Root CA certificate. First and foremost, you should be able to contact the company where you bought your certificate and they should be able to point you to the correct intermediate certificates needed. There are tools out there that can grab the intermediate certificates by using the CA Issuers /IssuingCertificateURL in the certificate to find the intermediates needed for the chain. Example is https://github.com/zakjan/cert-chain-resolver and the web service based upon it, https://certificatechain.io/. This usually only works for certificates from a recognized Certificate Authority.